Cumberland County is located atop the Cumberland Plateau in beautiful Tennessee. Nashville, the capital of Tennessee, and other large cities, such as Knoxville and Chattanooga are all easily accessible with just over a one hour drive from Cumberland County. The center of Cumberland County is within a days drive from 70% of the nation's population. The Crossville Memorial Airport is a contemporary, corporate facility complete with a 5,418 feet blacktop runway, hangars, charter service, and vehicle rental service. The airport is located less than 80 miles from Knoxville McGee-Tyson International Airport (TYS) and 100 miles from Nashville International Airport (BNA). The port city of Rockwood is also a mere 30 miles for Crossville. Averitt Express, USF Holland, and Ryder are only a few of the several national freight carriers that service Crossville. 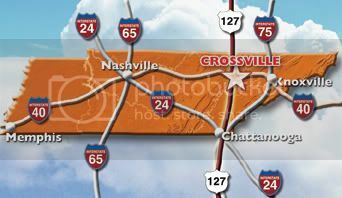 In addition to airports, Crossville has access to several state and United States highways, as well as two major U.S. Interstates, I-40 and I-75. With the numerous transportation alternatives, regardless of the destination, you can get anywhere from Crossville.